In the midst of confusion and panic, we need to think like Warren Buffett. Here is one indicator that tells us that the long term uptrend is still intact and that the Dow Jones can still stamp another all time high in the future. The stock market operates on the basis of possibilities. While you cannot have certainty in life besides death and taxes, you can still achieve a high degree of accuracy in determining the outcome of the financial markets. You do not need to be perfect to make money in the stock market. Just ask Warren Buffett and he will tell you he made many mistakes. He bought the wrong stock at the wrong time but he is still way ahead of others because his winners are much bigger than his mistakes. Today I'm going to show you a simple indicator that tells us that the bias for the Dow in the long term is still up. One of the best way to catch the trend of an index or stocks is to utilize multiple moving averages. In the charts below, I have put in these moving averages. I have colored each of them in different colors and well...they look really colorful and so I call this the Rainbow indicator. The perfect bullish uptrend happens when the faster MAs are above the slower MAs. If they are smooth and orderly, that means you can expect higher prices for the stock or index in the future. When the MAs are erratic and whippy, we are in a very volatile environment. Of course when the faster MAs crosses below the slower MAs it can hint of a bear market. The chart above is the monthly chart of the Dow Jones Industrial Average. 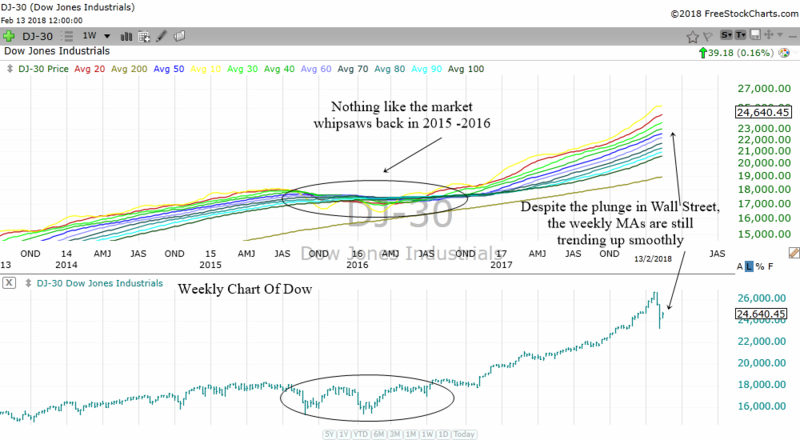 The top is the monthly moving averages of the Dow Jones while the bottom is the price chart. As you can see, when the moving averages are smooth and in order, the market is healthy and rising. When the moving averages start to contract and overlap each other, it tells us that the stock market is not trending up. The market might be experiencing volatility or sideways trading. When you start to see a shorter moving average cross below slower moving averages, this tells us that a bear market is about to happen or happening. 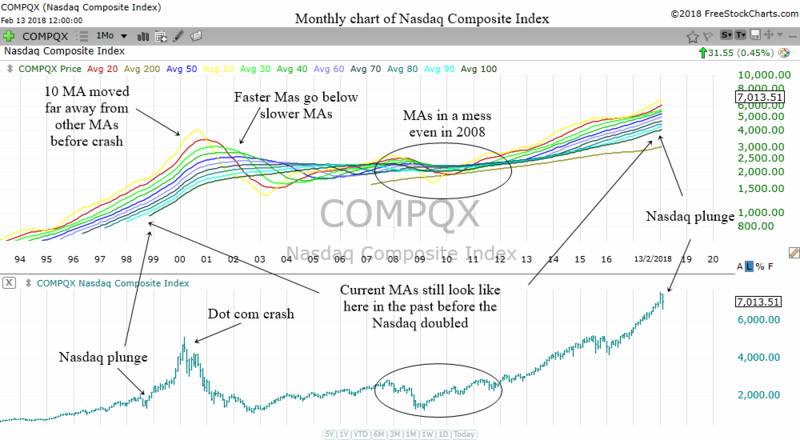 If you study the chart above, you will realize that the faster MAs cross below the slower MAs during the 2000 Dot Com crash and the 2008 Financial Crisis. The nice bullish run up from 1994 to 2000 is characterized by smooth moving averages running up nicely creating a nice net or rainbow. Despite the sell off recently, the moving averages still look like the bull run in 1994 to 2000 instead of the ones in the 2000 bear market or the 2008 bear market. Therefore, from the weight of this evidence, the bias for the stock market is still up rather than down. There are no certainties, but from history we know that the possibility of the bull run in the US market will continue is higher than the possibility of the start of a bear market. Let us also take a look at the S&P 500 with the Rainbow indicator. 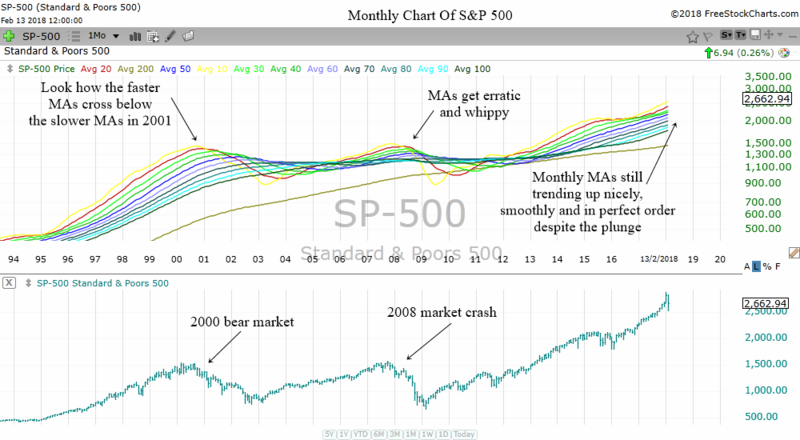 The chart above is the monthly chart of the S&P 500. 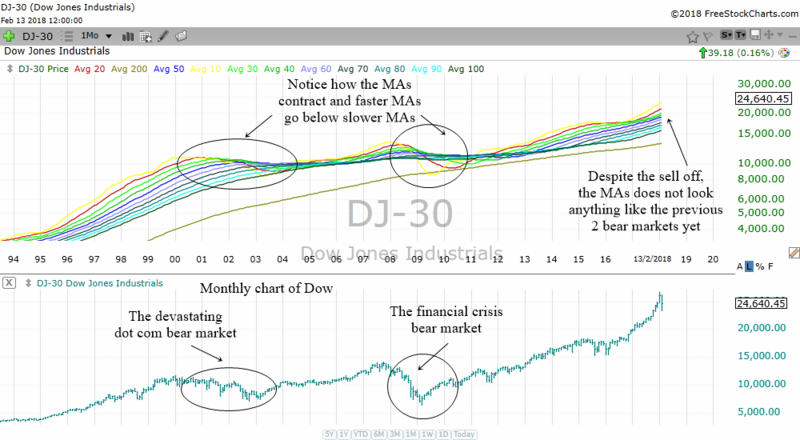 As you can see, the moving averages started to have crosses in the 2000 bear market and the 2008 market crash. The current MAs does not look like any of the crashes. Instead it looks like the healthy bull run from 1994 to 2000. Therefore, we should have a bullish bias for the long term instead of a bearish bias. The S&P 500 almost tripled from around 500 in 1994 to around 1500 in 2000. If history is correct, we might still have quite a lot of room to move up. I won't leave the Nasdaq Composite behind when we want to analyze the entire market. While the Dow and S&P 500 represents the US economy, the Nasdaq Composite which is more tech heavy represents the technology sector of America. The behavior of the MAs at this moment despite the plunge is still the same as the MAs back in 1994 to 2000 when Nasdaq experienced a massive run up. Take a look at the plunge Nasdaq experienced in 1999. Despite the fall, the MAs are still trending up nicely. This is exactly the same as what happened these few weeks. We had a massive sell off recently but the MAs are still trending up nicely and not showing any signs of cracks. One thing I would like to bring to your attention is the 10 MA (yellow line) which moved far away from the other MAs right before the 2000 Dot Com bubble. This moving away shows that the Nasdaq was running up too much too fast. Which is why the 10 MA moved away from the other MAs. This gave a warning that the run up was too overheated and not sustainable. Fast forward to February 2018, the 10 MA is still trending slightly above the other MAs. It has not move too far away from the rest of the pack. We can also use the Rainbow indicator on the weekly chart to give us a slightly smaller long term view of the markets. The chart above is the weekly chart of Dow Jones Industrial Average. As you can see, despite the massive plunge in the Dow, the weekly MAs are still trending up very nicely. This tells us that the long term trend is still intact and it favors a bullish bias instead of a bearish one. The MAs is nothing like what it is back in 2015-2016 where the Dow experienced a period of volatility in the weekly charts. Notice how the MAs squeeze together and there is no sense of smoothness during that period. No indicator is perfect. However, the moving averages can be a very powerful trend following tool. If they are travelling smoothly in a nice uptrend, this tells us to be open to more bull runs in the future. After all, when the trend is up, you should continue to be bullish till the trend changes. The trend is your friend!